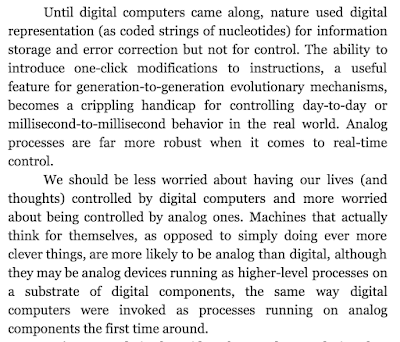 That's historian of technology George Dyson contemplating the dangers of analog intelligence rather than digital intelligence in John Brockman's latest "big question" compilation, this time on AI. 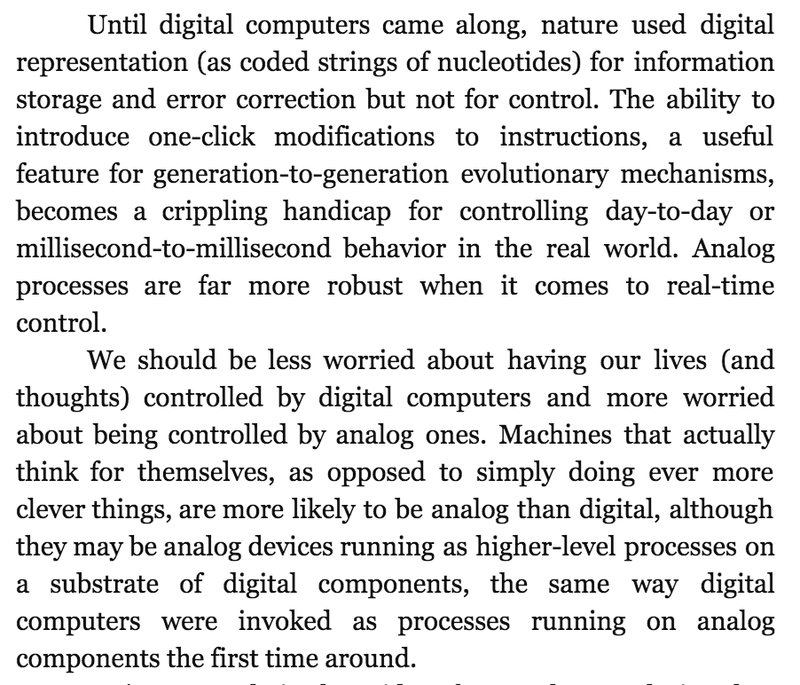 The real curveball however might be captured by another one of Dyson's quote: "My real worry is not that machines will become too intelligent, it's that humans will become too dumb." It's very gratifying to see this year's Nobel Prize for Physiology or Medicine awarded to three scientists (William Campbell, Satoshi Omura and Youyou Tu) who have contributed to the discovery of novel drug substances that have decided benefited the lives of millions of human beings and animals. The prize was awarded to the discovery of avermectin and artemisinin. Avermectin cured nematode infections in millions of livestock animals including cows and pigs and its derivative ivermectin can cure river blindness, a disease primarily affecting poor people. Artemisinin can halt malaria in its tracks and contribute to substantial reduction of mortality. It is hard to thing of a discovery which satisfies Alfred Nobel's stipulation of providing the "greatest benefit to mankind" more than this one. It's particularly gratifying to see pharmaceutical research being recognized with the prize. The last time the prize was awarded to drug discovery was in 1988, to Gertrude Elion and James Black. Both Black and Elion worked in the private sector. William Campbell who is one of this year's recipients also worked in the private sector at Merck in the 1980s when his team discovered avermectin. The strain of bacterium (Streptomyces) which yielded the drug had been discovered by Satoshi Omura's team in Tokyo. The collaboration was a perfect example of the public and the private sector working together to bring medical benefits to humanity. Campbell's team at Merck also discovered the even more potent derivative of avermetic, ivermectin, and this was discovered purely synthetically. It's also worth noting that Merck made avermectin available for free to treat river blindness in a generous gesture. Youyou Tu's work on artemisinin in China during the 1960s is another lesson in pharmaceutical discovery. In the 1960s millions of poor Chinese were dying of malaria. The frontline drug, chloroquine, was being increasingly ineffective. Remarkably, Tu found an obscure reference to a document on traditional Chinese medicine written in 340 BC which described the potentially healing antimalarial powers of a herb steeped in cold water. By testing more than 200 extracts Tu discovered artemisinin. The initial paper in 1979 elicited skepticism and smug dismissal (partly because it came from communist China), but over the next thirty years artemisinin turned into a drug of choice for treating malaria. Both artemisinin and avermectin exemplify the power of old-school chemistry and microbiology, a nexus blazed by antibiotic pioneers like Alexander Fleming and Selman Waksman, and one which has been largely forgotten in the last thirty years. In addition both compounds are natural products, and the prize underscores the value of drugs from nature (which already make up about fifty percent of all marketed drugs). Artemisinin in particular is also a vigorous validation of the potential of traditional Chinese (and other) medicine. This kind of medicine is completely different from homeopathy since it involves the use of actual chemical substances and herbal extracts. The story of artemisinin clearly indicates that we need to pay much more attention to forgotten examples from traditional Asian medicine and subject them to scrutiny. Let's make no mistake about it: Today's Nobel Prize should thus be a resounding tribute to the power and humanity of pharmaceutical research. These days we are justifiably reluctant to associate that second adjective with anything to do with pharma; we are justifiably indignant at the price hikes, the off-label marketing and the other shenanigans which drug companies and CEOs sometimes indulge in. Yet this prize demonstrates that pharma, even Big Pharma, can do untold good, not just in discovery but in philanthropy. The distinguishing factors which characterized Merck in the 1980s were a strong focus on basic research (when my PhD advisor worked there during that time, people called it the "Merck University") and leadership under CEO Roy Vagelos - a rare, distinguished scientist at the helm who was a member of the National Academy of Sciences. Merck's success and largesse from the 1980s should be a role model for drug companies today- including Merck itself. Interestingly, today's Nobel Prize is also great tribute to research which is decided non curiosity-driven and non-accidental. As this report on the discovery of avermectin from Campbell and his team says, "The discovery of the avermectin family of compounds was by no means serendipitous" (hat tip: Amanda Yarnell). I am as big a fan of curiosity-driven research as anyone else, but both avermectin and artemisinin were discovered with the express goal in mind of curing human disease. There is much to be said for this kind of deliberate applied research, supported by generous funding and vision at the top. The recognition is also a tribute to the power of synthetic chemistry to create lifesaving substances that did not exist on earth before. Ivermectin is a purely synthetic derivative of avermectin created by using a chemical reaction (catalytic hydrogenation - itself awarded a chemistry Nobel Prize) that itself did not exist before. So there it is: A Nobel Prize awarded to the benefits of private and public pharmaceutical research, awarded to the power of synthetic chemistry, awarded to the great potential of traditional medicine, and awarded to a female scientist. There's few Nobel Prizes that present such a happy constellation of qualities in one little package. Alfred Nobel would have been pleased. Over the years chemists have come up with many different ways to talk about the structure and energetics of molecules and especially to compare these parameters between various compounds. Doing this comparison is not just an academic exercise; for example, knowing which drug molecules are ‘similar’ or ‘different’ can be the deciding factor in picking one drug over another. It is also crucial for knowing the kinds of side effects that drugs can induce by interacting with off-target proteins. Unfortunately the application of these simple descriptions to matters of molecular description is a very good example of what happens when language collides with fuzzy, ill-defined facts in nature. ‘Similarity’ is a classic example. When you are talking about two drugs being similar for instance, are you talking about their similarity purely in terms of molecular structure (which itself can be defined in many different ways), or their similarity in terms of their effects on cancer cells, or their similarity to engage a common protein target in the body, or through similar side effects? Clearly there are many different ways to define similarity and all these ways are subjective to a large extent. But there is a problem with applying language to chemical concepts even at a very limited and basic level. A great example of this conundrum is hinted at by a paper from Brian Shoichet’s group at UCSF that just came out in the journal ACS Chemical Biology. The paper asks a very fundamental question: Do identical small molecules or ligands bind to very different proteins? The question in fact goes deeper: How do you define similarity and differences between various proteins to begin with? To investigate this question, the authors consider 59 ligands bound to 119 different proteins in the PDB. Many bind with high affinity, ranging from low nanomolar to mid micromolar. What the study does is to classify these protein-ligand pairs into three groups. The first group consists of pairs in which the same atoms in identical ligands bind to similar or identical residues in different proteins. The second group consists of the same ligand atoms in identical ligands binding to similar kinds of residues (hydrophobic, positively charged etc.). The third group in a sense is the most interesting since it involves identical ligands binding to completely different proteins; in these cases the binding involves neither similar ligand atoms nor similar protein environments. The authors find that a good two thirds of the set of protein-ligand pairs involve identical ligands binding to proteins with dissimilar residues. In addition, half of these involve ligands binding to proteins with completely different environments. There is thus no ‘pattern-matching code’ for the same ligand binding to different proteins. "A reason why there is no simple code for ligand recognition among binding sites is that proteins have found multiple, at least superficially unrelated ways to recognize most common ligand groups. Thus, cationic amines can be recognized both by anionic residues such as aspartate or glutamate, but they can also be recognized by cation-Pi interactions. Nucleotide phosphates can be recognized by cationic residues such as arginines, but recognition by main chain amide nitrogens in a P-loop is also common. 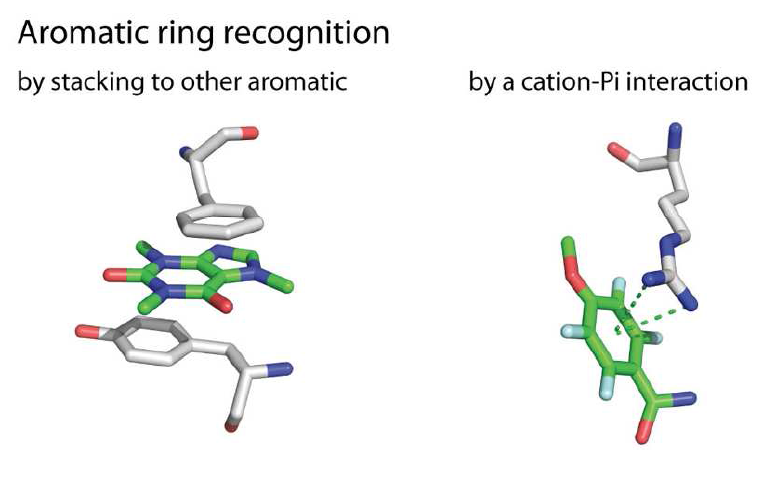 Ligand aromatic groups can stack with tyrosines, phenylalanines and tryptophans, but they can also form cation-Pi interactions many other variations might be mentioned." But sometimes hydrophobic groups can also snuggle up against polar atoms or poke out into solvent and polar groups can nestle into hydrophobic pockets to various extents, simply because the other atoms in the ligand compensate for such uneasy alliances by forming favorable interactions. This can lead to the same ligands binding to very different protein atoms. As I mentioned in a previous post, atoms end up somewhere simply because they can. The differential placement of atoms in protein pockets is reflected in the different binding affinities that the authors see in their set. From an evolutionary viewpoint this observation is very interesting. Protein-small molecule binding was constrained during evolution by the basic chemistry and physics of binding on one hand and by the damage incurred by too much non-specific binding on the other (as an extreme case, if every small molecule bound to every protein, there would be way too much noise and biological signaling networks would be effectively impossible). Thus there had to be a balance between promiscuity and specificity. Nature achieved this balance by tuning the affinity of small molecules for proteins over a wide range and by making sure that even weak affinity could translate to significant biological effects. Unfortunately these are precisely the affinities that we ourselves want to finely tune in a drug discovery program and as the paper shows, this is always going to be an uphill battle because of the multitude of interactions and the lack of correlation between ligand and binding pocket structure (one conclusion from the paper is that you cannot always predict new targets for known ligands simply by computationally comparing binding sites). But on another level I think this problem also speaks to the paucity of the language that we have for describing binding affinity and molecular interactions in general. Our metric for similarity in this case is the presence of similar ligand atoms binding to similar protein atoms. 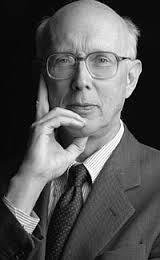 But nature can use another very simple measure of similarity – similarity in binding energy. It is not unreasonable to say that a ligand binds similarly to two proteins if it exhibits a similar binding affinity to both of them. And this binding affinity need not even be very different since even a few kcal/mol difference in binding energy can translate to a thousand fold difference in actual affinity (say from micromolar to nanomolar). Thus, what we call dissimilar binding may actually be judged as quite similar by nature. 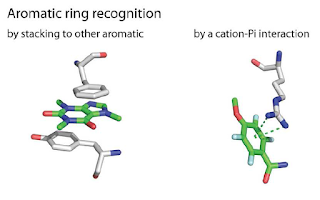 Consider the picture at the top of the post for instance: an aromatic ring can interact with a protein through either a stacking interaction with an aromatic amino acid or through a cation-pi interaction with a positively charged amino acid. The two interactions look very different, and yet they involve the same binding affinity. All this goes back to something we mentioned before: Similarity is in the eye of the beholder, and what our eye sees as squiggly lines of ligands and protein residues on a computer screen, nature sees simply as thermodynamics, kinetics and quantum mechanics, and all of it lying on a continuum. We might be dismayed to know that the same ligand is binding to very different proteins, but this is because nature may not be regarding them as very different to begin with. To figure out protein-ligand binding then, we may have to see things from the point of view of nature rather than that of our impoverished language.